I GIVE YOU A NEW COMMANDMENT - In this Sunday's Gospel (John 13:31-35), we listen in near the end of the Last Supper: Judas had just departed as Jesus exposed him as his betrayer. Jesus saw this betrayal and his impending death as his glorification. Jesus knew what the others did not. His teaching to his apostles at this moment was to give them a new commandment - a new way of living the mission. "When Judas had left them, Jesus said, 'Now is the Son of Man glorified, and God is glorified in him. If God is glorified in him, God will also glorify him in himself, and God will glorify him at once. My children, I will be with you only a little while longer. 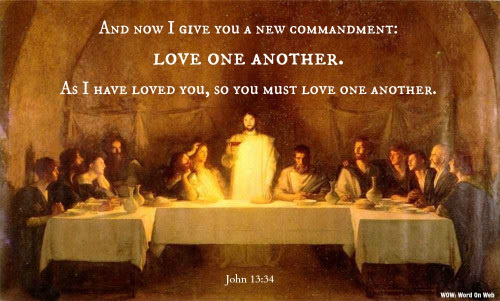 I give you a new commandment: love one another. As I have loved you, so you also should love one another. This is how all will know that you are my disciples, if you have love for one another.'" Our first reading (Acts of the Apostles 14:21-27) is evidence that the apostles took Jesus' new commandment to heart. Today, we hear the continuing story of how Paul and Barnabas went from town to town, over great distances and enduring great hardships, bolstering and sustaining their fledgling new communities of love. They were living examples of Jesus' selfless love. "After Paul and Barnabas had proclaimed the good news to that city and made a considerable number of disciples, they returned to Lystra and to Iconium and to Antioch. They strengthened the spirits of the disciples and exhorted them to persevere in the faith, saying, 'It is necessary for us to undergo many hardships to enter the kingdom of God.' They appointed elders for them in each church and, with prayer and fasting, commended them to the Lord in whom they had put their faith. Then they traveled through Pisidia and reached Pamphylia. After proclaiming the word at Perga they went down to Attalia. From there they sailed to Antioch, where they had been commended to the grace of God for the work they had now accomplished. And when they arrived, they called the church together and reported what God had done with them and how he had opened the door of faith to the Gentiles." In our second reading (Revelation 21:1-5), John continues his apocalyptic vision of the end times, when all of the suffering, tears and trials will be wiped away. "Then I, John, saw a new heaven and a new earth. The former heaven and the former earth had passed away, and the sea was no more. I also saw the holy city, a new Jerusalem, coming down out of heaven from God, prepared as a bride adorned for her husband. I heard a loud voice from the throne saying, 'Behold, God's dwelling is with the human race. He will dwell with them and they will be his people and God himself will always be with them as their God. He will wipe every tear from their eyes, and there shall be no more death or mourning, wailing or pain, for the old order has passed away.' The One who sat on the throne said, 'Behold, I make all things new.'" Today's Gospel passage, specifically the part about the "new commandment" is a wonderful opportunity to practice meditating on the Gospel. This is a form of Lectio Divina or praying with scriptures. So consider this challenge: read today's gospel passage multiple times, each time reflecting and contemplating more deeply on its meaning. Ask yourself, What does it mean to love one another as Jesus has loved us?. What does God have to say to me directly? Click HERE to read more about Lectio Divina or praying with scriptures.